Borrowing from Native American legend, the 11 lakes that cross central New York became known as the Finger Lakes. It was believed by the early residents that the Great Spirit blessed this 9,000-square-mile land with his hands. 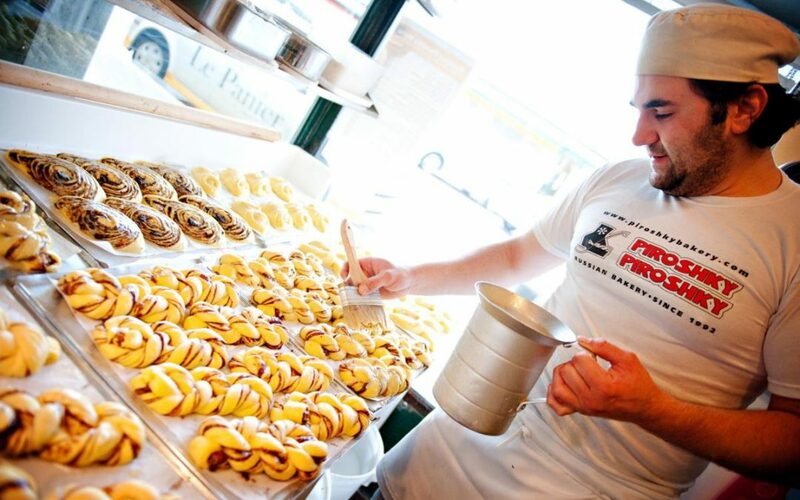 Today, there is much to see and do in the 14-county region. From virtually every outdoor activity imaginable to festivals to museums, it’s easy to fill a Finger Lakes itinerary. 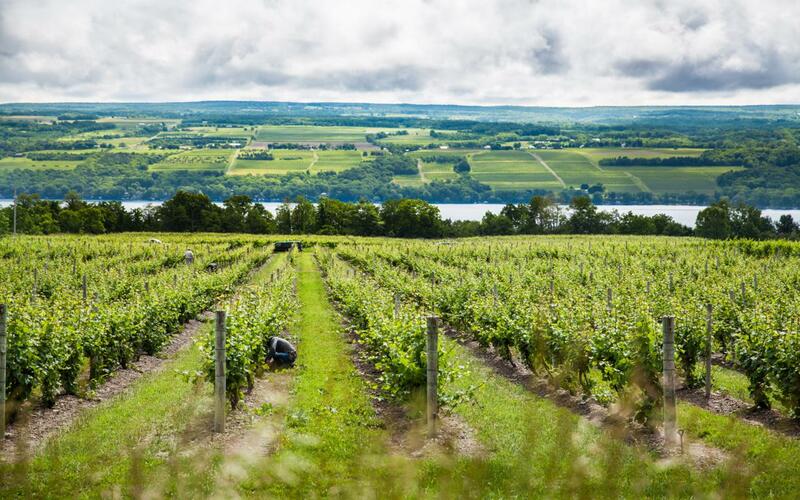 In the largest wine-producing region in the United States east of California, it’s only logical to begin exploring the Finger Lakes on one of its four wine trails. 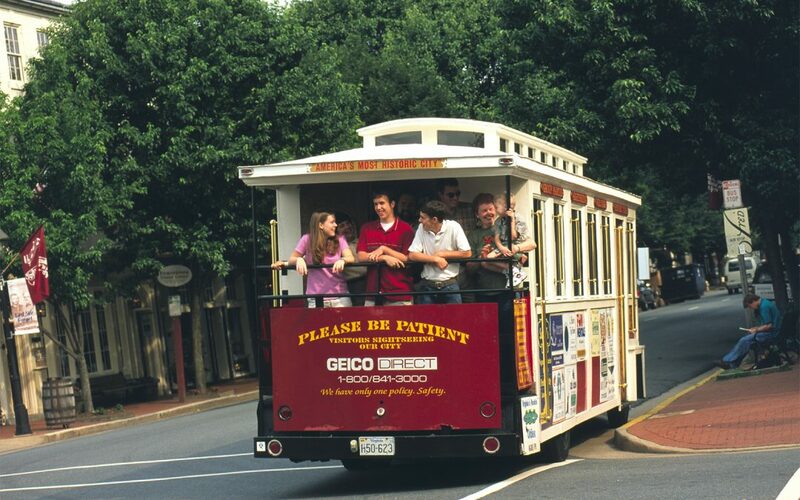 On every trail, you’ll find great wine, great restaurants and accommodations, shopping and plenty to do. The fabulous scenery around the lakes is a bonus. Let’s begin with the wineries, remembering that not everyone in the group drinks wine. No worry since some choices on the trail offer craft beer or cider. In Naples, Arbor Hill Grapery was the first to produce a spicy but semi-sweet white known as Traminette. You may get lost in its large gift shop. Also in Naples is boutique winery Inspire Moore Winery. Small lot production of aromatic varietal whites and vintage-driven varietal reds provides only 1,000 cases annually. Rounding out the Naples-area wineries is Hazlitt’s Red Cat Cellars. Along with its signature Red Cat, there are award-winning dry wines and Cider Tree, a sparkling hard cider. Hazlitt’s is one of the oldest wineries in the region. In Canandaigua there are two wineries to visit. Heron Hill Tasting Room on Canandaigua Lake is the winery’s third tasting room in the Finger Lakes region. In the 46th year since planting its first viniferous vines overlooking the lake, Heron Hill is recognized as a leader in the area’s Riesling production. 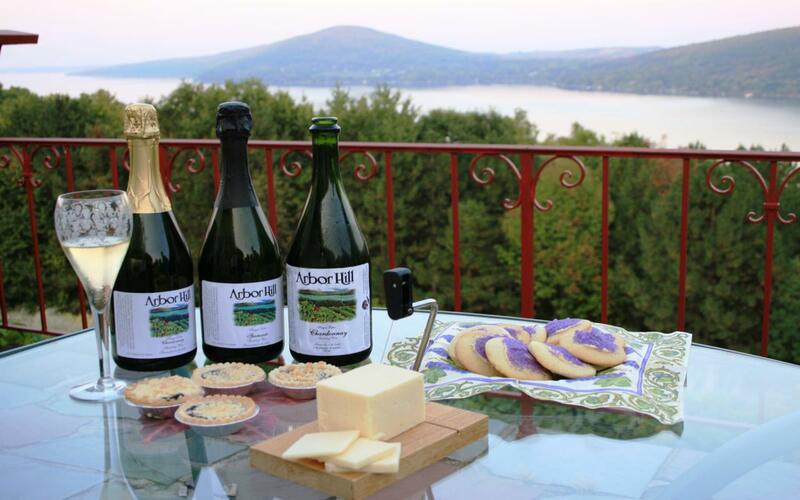 New York Kitchen celebrates all New York state wines, craft beers and ciders. 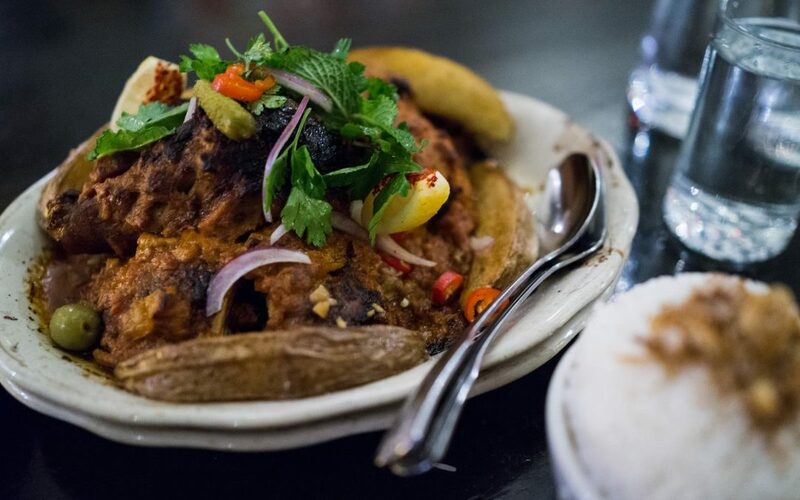 There are the Tasting Room and The Pantry, but plan to enjoy lunch or dinner in the restaurant. 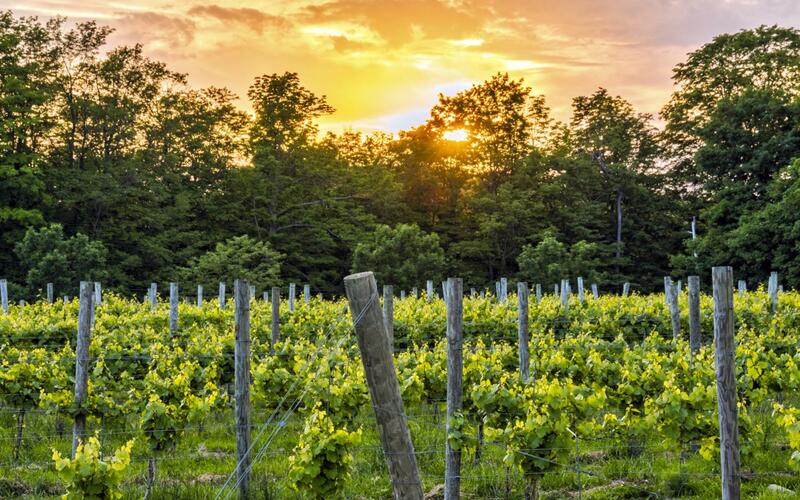 In Fairport, just south of Rochester, you’ll discover Casa Larga Vineyards & Winery, a major player in the Finger Lakes wine region for almost 40 years. Quality, award-winning wines are a tradition at Casa Larga. Another boutique winery along the trail is Raymor Estate Cellars, which perfected its wines for 20 years before selling them in 2011. 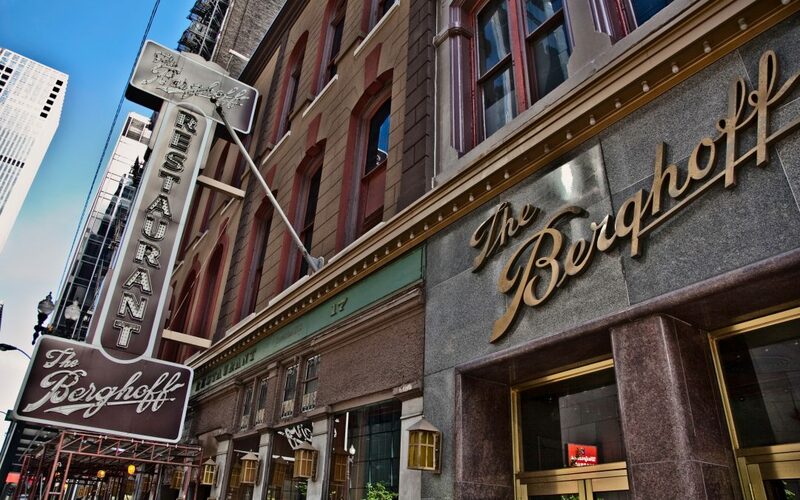 Groups of 10 or more should make reservations well in advance of arrival. Begin planning your visit online at canandaiguawinetrail.com. Email canandaiguawinetrail@gmail.com for more information. Founded in 1983 to promote the wineries in the area, the Cayuga Lake Wine Trail with just four wineries became America’s first wine trail. Today, the trail has grown to include 14 wineries. Interlaken is home to American Vineyards, where you cannot go wrong with the award-winning wines and homemade fudge. Also in Interlaken, Lucas Winery, the first on Cayuga Lake, is celebrating 38 years of making outstanding wines. Button Grove Winery in Romulus is winner of the 2017 Governor’s Cup and features some of the best lake views from a multi-level deck. Also in Romulus, Goose Watch Winery has been producing wines from historic local varietals and was honored as “Winemakers of the Year” at the 2017 San Francisco Wine Competition. Nearby Knapp Winery for 35 years has been producing viniferous wines for enjoying in its Vineyard Restaurant. Swedish Hill Winery has numerous 90-point-rated and gold medal wines and is a three-time Governor’s Cup winner. Varick Winery & Vineyard is the fifth but certainly not last of the Romulus sites with its relaxed atmosphere, wines and complimentary jellies, mustards, herb dips and other condiments. Cayuga Ridge Estate in Ovid is a relaxing tasting setting and offers savory wood- fired pizzas. Hosmer Winery, not far away, has been growing grapes and making wine in the European tradition since 1985, garnering them numerous international awards. With 150 acres of lake frontage, Thirsty Owl Wine Company provides a beautiful setting for tastings and lunch at Bistro. 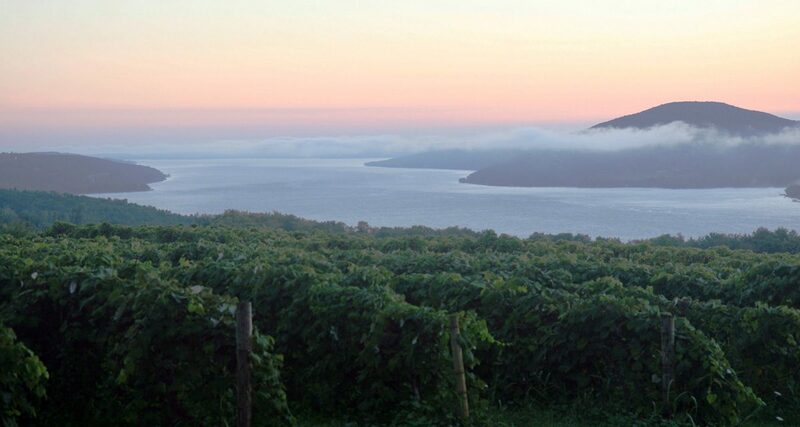 Toro Run Winery boasts the “Best View” in the Finger Lakes along with world-class wines. On the east side of Lake Cayuga near Aurora and with spectacular views of the lake sits Long Point Winery, specialists in both red and white dry wines. Seneca Falls is where you’ll discover Montezuma Winery Hidden Marsh Distillery, the latter “Winner of the NYS Best Distilled Spirit 2011-2013,” while the former offers a taste for every palate. Just a few miles from downtown Ithaca, SixMileCreek Vineyard offers memorable wines and distilled spirits with panoramic views. Again, groups of 10+ should make reservations in advance. The fall months are particularly busy. Get started with planning at cayugawinetrail.com. Email info@cayugawinetrail.com for additional information. With 34 wineries on both sides of Lake Geneva, this trail offers the most options. Ravines Wine Cellars in Geneva features a beautiful tasting room and The Ravinous Kitchen, a seasonal restaurant. Belhurst Estate Winery award-winning wines are as unique as Belhurst Castle. Zugibe Vineyards welcomes groups to its tasting room with estate viniferous wines in both dry and semi-dry styles. Three Brothers Wineries & Estates is unique in having three wineries and a microbrewery on site, featuring handcrafted wines, microbrews and hard cider. With dry, Old World-style wines, Ventosa Vineyards is a bit of Tuscany in the Finger Lakes. Fifteen premium wines, live music on Friday and Saturdays, handcrafted beers and hard cider, and lake views welcome you to White Springs Winery in South Geneva. Fox Run Vineyards in Penn Yan offers estate-grown, award-winning wines, and a food and wine tour experience. Serenity Vineyards estate-grown reds and a new semi-sweet line are enjoyed in the rustic tasting room. A medieval theme and gold medal wines define Seneca Shore Wine Cellars. A uniquely designed tasting room, distinct award-winning wines and a new art gallery await visitors at Anthony Road Wine Company. Premium estate-grown wines are enjoyed at Prejean Winery, established in 1986. Also in Penn Yan, Torrey Ridge Winery promises “a good wine is a wine you like” among its dry and sweeter offerings. Earle Estates Meadery provides a wide selection of meads, fruit wines and hard cider. With almost an antebellum look, Miles Wine Cellars welcomes visitors to its 200-year home in Hamrod to enjoy estate wines. A newly remodeled tasting room featuring the Riesling experience is waiting at Villa Bellangelo in Dundee. Fruit wines from Blueberry to Exotic Chocolate Razzberry and a variety of grape wines are at the Fruit Yard Winery. Hickory Hollow Wine Cellars features viniferous red and white wines and the famous Liquid Explosion. Seneca Lake’s oldest winery Glenora Wine Cellars presents award-winning wines and Veraisons Restaurant for breakfast, lunch and dinner. A large tasting room resembling an old barn and wines drawn from both native and hybrid wines are awaiting groups at Fulkerson Winery. In Rock Stream, its namesake Rock Stream Vineyards is Seneca Lake’s only grappa and grape brandy producer, and makes other unique wines. For 30 years Watkins Glen’s Lakewood Vineyards has been sharing their passion for Finger Lakes wine with visitors. Just a few miles from the center of Watkins, Glen Castel Grisch Winery is serving everything from dry reds to ice-style wines. Lost Irishman, Sweet Revenge and a hard apple cider are specialties of boutique winery Catharine Valley Winery in Burdett. Nearby J.R. Dill Winery offers a wide selection of wines along with historic photos of their southeastern end of Lake Seneca location. Atwater Estate Vineyards uses estate-grown fruit to produce dynamic varietals. In Hector you’ll travel down a sloping driveway with Lake Seneca as a backdrop to taste winners of Governor’s Cups, Jefferson Cups and Gold from Riesling du Monde at Chateau LaFayette Reneau. Small-batch, handcrafted wines are made from estate- grown premium grapes from the family-owned Leidenfrost Vineyards. Hazlitt 1852 Vineyards, established in 1985, is known for its award-winning Sauvignon blanc, Riesling and Cabernet Franc. A spacious tasting room welcomes guests to Penguin Bay Winery for Pinot grigio, Riesling, Cabernet Franc, Moscato and more. Sweet, semi-dry and dry wines in a fun, friendly atmosphere are the calling card for Bagley’s Poplar Ridge Vineyards. Caywood Vineyards in Lodi invites visitors to a tasting in the 1800s restored barn and grape packing house set among one of the East’s largest vineyards. 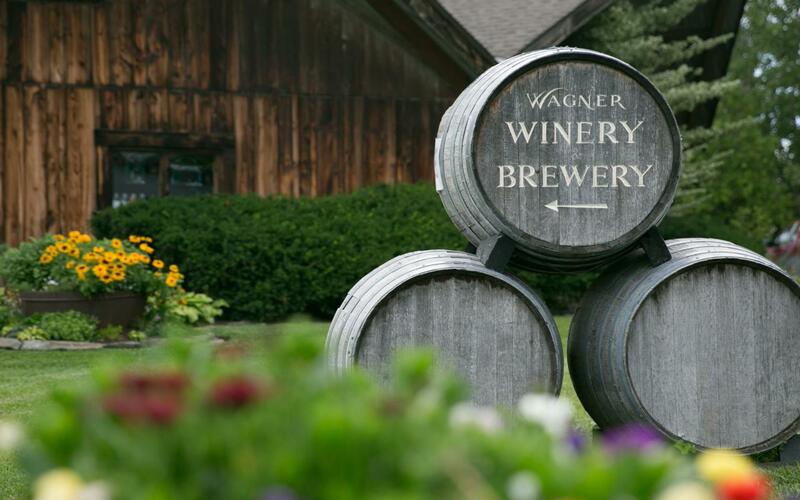 Close-by Wagner Vineyards offers more than 35 styles of wine with a friendly staff to help you find your favorite. Lamoreaux Landing Wine Cellars has built its craft on passion and commitment and an understanding that great wines are a natural expression of where they’re grown. Boundary Breaks Vineyard is just north of Lodi Point State Park and focuses on making wines that score 90 points or more. The family-owned Hunt County Vineyards in Brockport provides winery tours and a range of distinct wines, including ice wine. Seasonal items are served in The Cafe. Just up the road in Keuka Park you’ll find Vineyard View Winery, a fifth- generation grape farm with a tradition of producing quality wine from deep-rooted vineyards. 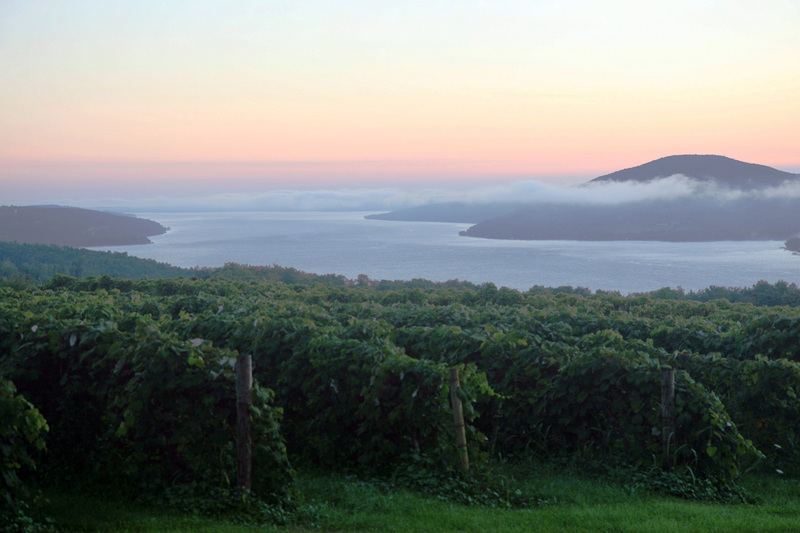 Wines from dry to sweet are served in a tasting room with a dramatic view of Lake Keuka. Since 1985 Keuka Spring Vineyards has been producing a variety of world-class reds and whites from its Penn Yan vineyard. Among accolades received are a two-time winner of the Governor’s Cup and Best White Wine in America. On the east side of the lake in Dundee, McGregor Vineyard has been the pioneer in producing dry red and white wines from its European wine grapes. Local food samples often accompany relaxed tastings. For additional trip planning for groups of 10 or more, begin online at keukawinetrail.com. Email info@keukalakewinetrail.com.